Dr. Bellini knows a lot about dreams and the important part that people and hard work play in achieving them. He gave $10-million of his personal fortune in 2002 to get the Life Sciences Complex started. Once Dr. Bellini’s gift was in place, government money and funding from other sources began coming in. In six short years, Dr. Bellini’s vision is being fulfilled. Dr. Bellini also knows the value of good people and hard work. 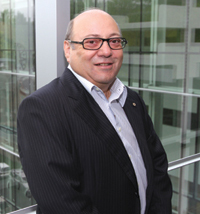 An Italian native who immigrated to Montreal in 1967, Dr. Bellini aspired to become a full fledged scientist, enrolling in night classes at Concordia University and following up his BSc with a PhD in organic chemistry from the University of New Brunswick. Through BioChem Pharma, the Montreal based firm he co-founded in 1986, Dr. Bellini catapulted Canadian biopharmaceutical research to global prominence. By the late 1980s, in collaboration with the late Bernard Belleau, a McGill graduate and chemistry professor, Dr. Bellini developed and commercialized 3TC, the first anti-HIV compound drug, which remains the cornerstone of combination HIV/AIDS infection therapies. Dr. Bellini stressed that his donation recognizes the critical role McGill researchers have played in his past endeavours. He hopes his gift enables McGill students and researchers to continue being at the forefront of health and science research.